Each passenger must provide passport information/ID details during the booking process. These are optional and paid direct on the day. Very enjoyable day. All went smoothly. Mount Etna was awesome a & Taormina was so colourfull and full of scenic sites. The holiday was extraordinary for us. We never forget. Thank you. Was very,very nice..,only issue was the rough sea at departure from Malta,but after was great! Thank you so much for a nice day trip!! Kind regards from Transylvania. Val Maris. The tour was fantastic ! Taormina was amazing and the tour guide was great and spoke fantastic English. It was a birthday to remember!! The tour guide was very informative and very pleasant, shame the staff aboard the catamaran weren't as friendly but i didn't let that spoil my day. Taormina was pretty but again the people i encountered working in the shops not so pleasant but you just look passed that. For me mount Etna was the highlight and I would have preferred to have spent the whole day there but unfortunately I couldn't find a tour that did just this from malta. This was just a personal preference though so not taking anything from Taormina. It is a very very long day but so worth it. Thank you malta travelnet for making my birthday special. Enjoyed the trip. Was a long day but well worth it. A bit disappointing at the very end when the Catamaran arrived back in Malta and would not let the passengers off for 20 minutes after going quayside. Can appreciate the delays due to other vessels departing or arriving but once the ship has come alongside the passengers should be able to depart before all the cars are offloaded from the ferry! This was not an issue when we arrived in Sicily. Great tour! we loved it! Enjoyed it very much,tour guide explained everything and the places we passed through,weather was excellent. Very well organized, wonderful trip. This trip was the best part of my Maltese trip. The stay in Taormina,in my opinion,is either too long for visiting(there aren't a lot of things to visit), or too short for going down the hill to the beach(which is amazing). But overall, this trip is the best thing you could choose to take especially if you stay for more than 3 days in Malta. I think it would be better for that money that wolud be included the lunch. And...30€ for going up the hill to Etna is too much, because, you can see nothing that you couldn't see down hill. Thank you for your review, however you only mentioned two things which do not form part of the tour? We do offer a tour to Sicily which includes lunch, you did not book this tour! 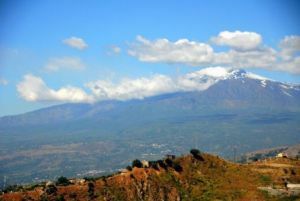 And the cable car trip further up Etna is an optional extra as mentioned on our website, so it was your choice to do it. What about the actual you booked, how was that? Really enjoyable. Taormina was beautiful and Etna was very impressive. I couldn't fault anything. While it was a very long day for us we really enjoyed the tour. Our tour leader was great and very knowledgeable. Would be happy to recommend it to anyone. Thank you for your comments. To make it very clear about your comment "would be the cost of the trip up mt etna , at over 120 euros per couple- it was robbery", that is something optional which you decided to do. You where already up Mount Etna, you paid that amount because you wanted to visit the absolute PEAK of the mountain with cable car and then 4X4 vehcicles which are accompanied by mountain guides...this is another tour. Obviously it is a long day which you rightly put it, Sicily is after all the largest island in the Med...and also the most spectacular! We enjoyed this tour so much! Never saw more beautiful places then Taormina village! Etna was also stunning! Trip was long but very enjoyable! Visited local craft shops where bought lots of local wine, jams, olives tasted delicious food. The tout cost quite a lot but worth every penny! Thank you! Trip to Sicily was fantastic. Russian guide was very excellent, we got a lot of interesting information and we spent a wonderful time. Everything was good except that day it rained all day. Would have been better to have spent more time in Taormina than go to Mount Etna, where we could see nothing. Also I think some food should be included in the price. Apart from that it was a great day out - just a shame about the weather, which I know is not your fault. It was awful. The day was far too long and it need not have been if we did not have to spend so much (three or more hours) in Taormina, that was a complete waste of time, as 45 mins would have been ample. The guide that we had mumbled his way through a boring, hard to hear speech about Sicily and made no attempt at humour or making it interesting. It was learned off pat which did not encourage anyone to bother listening to him. However, the trip up Mount Etna was well worth the time and extremely interesting. I was not collected at my hotel like everyone else, so had to make my own way to the ferry at 4.30am being ripped off by the taxi driver and then I had to persuade the bus driver collecting other passengers at the end of the trip to drop me back at the hotel at around midnight. The itinerary includes free time at both Taormina and Etna. I can understand that if you do not like to view stunning views, ancient sites such as the Greek Theatre, cathedral and monestary. The quaint alleys lined with curiosity shops..and not to forget the fabulous eateries available - Taormina would have been a big disappointment anybody that does not enjoy these things. You where not pick up because you did not book transfers, these can be booked (and paid for) at the time of booking the tour...like all other passengers do. With regards to the guide. Unfortunately he is from Sicily and maybe sometimes an Italian speaking English is not quite as clear as an English person speaking English. But he was the same guide that took you to Taormina and Mount Etna, yet you found the Etna visit EXTREMELY INTERESTING??? Fantastic value, slick management, they did everything they promised, amazing trip that works well with staying in Malta. Set Meal advice at the restaurant was good value compared with the other restaurants. Pleased we took this safer option. The tour was very long and involved a lot of travelling but going up Mt Etna was worth it. You do have to budget for cable car ride - 30 euros (on top of tour cost) and if you want to go even further up mountain some more money for off-road bus which I didn't take. Taormina was very picturesque and nice stop off on way to Mt Etna. Well planned, but no assigned bus, number 34 at end of tour when arriving back in Malta. Was very confusing as to which bus to take us back to the hotel. very good tour and well organised, plus sicily is very beautiful !! however it would have been nice to know before hand that you have to pay an extra 30 or 60 euros to go up mt. etna / i missed out because of this. Thank you for your review. I would like to point out that you where already on Mount Etna at Silvestri Craters which are at 2000 metres above sea level. In your review you are referring to the option to go to the very PEAK which involves a long cable car ride and a 4x4 truck ride plus a trek...this takes an additional 2 to 3 hours to complete. I must point out that this is not always possible for two main reasons 1. There has to be enough time available to do this option, 2. The weather must be suitable as not to delay this option. As we cannot always guarantee these two very important issues, it would irresponsible if we advertised this option. We will however consider including this information in our standard tour description. The tour staff were very friendly. Shuttle bus to the ferry arrived right on time. My wife uses a wheelchair and the bus and ferry staff were very helpful. The bus tour in Sicily was good. Tour guide and bus driver were helpful. The stop on Mount Etna was a bit long for people who did not want to take the cable car to the summit. Restaurant and washroom facilities were not the best. One washroom was closed and the other at the Terrazzo dell'Etna restaurant was the worst we've encountered and they asked for a 50 cent contribution "to ensure good service." (However, this was not Malta Travelnet's fault.) A good tour, but a very long day. Enta nice. Worth of it, but taormina waste of time. All the nice places you can see only from the coach. And they will give you free time in the town centre full of tourist.